Choose polished 14k yellow or white gold. 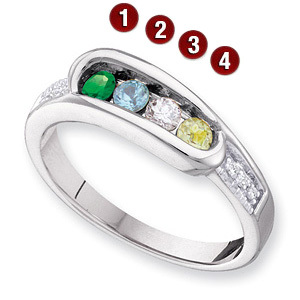 This mother's ring offers stone personalization for 1-4 round gemstones. Each prong-set gemstone is 2.75mm in diameter. Choose simulated or genuine gemstones. Made in USA. Both genuine and simulated stone rings have diamond accent stones [.02 ct tw, I1 clarity, G-I color]. Approximate weight: 3.5 grams.